Boiler replacement in Minneapolis is easy with Mill City Heating & Cooling. 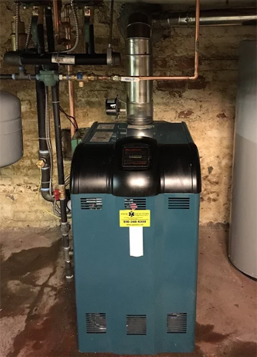 Just recently we received a call from a busy homeowner who wanted to replace her boiler but had very little time available. Mill City Heating & Cooling arranged to meet the homeowner in the evening for a free estimate. The homeowner was ready to move forward with the replacement, but she left for work every morning at 5:30 am. Mill City Heating & Cooling dropped off a lock box for the homeowner so she could leave a key for us to access the boiler and we went to work. When she returned home she was amazed to find that the old boiler was removed and replaced with a new model and space looked untouched. Now all she has do is wait for her rebate check to arrive in the mail from her gas company.